Many people will argue which subpar Monarch deck list is the best. 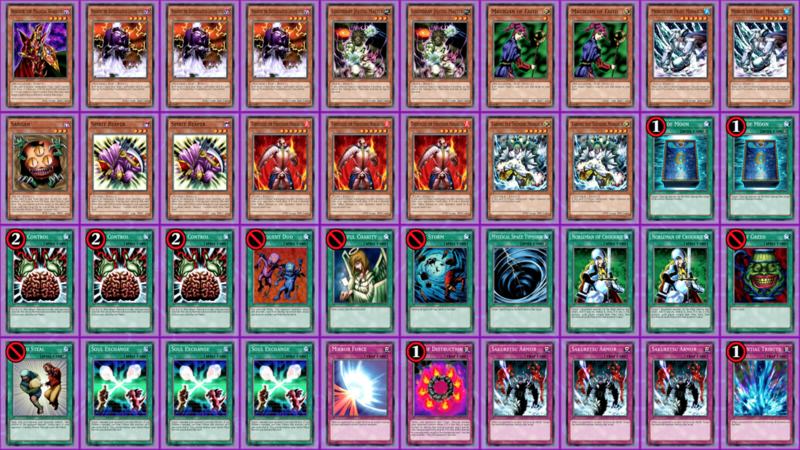 This is a random list I found which is about as good as a Monarch deck can get. 1) Tsukuyomi hard-counters the low 1000 DEF of the Monarchs. 2) The Attributes of Mobius, Thestalos and Granmarg make them difficult to synergize with BLS Envoy. Zaborg is a LIGHT monster but its literally unsummonable if the opponent has no monsters. 3) Due to the prevalence of set monsters and face-up floaters, Brain Control is not reliable. 4) Soul Exchange prevents the deck from attacking, which is unfortunate because the most important aspect of a Tribute monster is the ability to punish the opponent the turn it is summoned. This is why Airknight is popular, and why Soul Control Monarch builds can’t fully utilize it. 5) In general, in all formats, Monarchs have a consistency issue. Both the tribute monsters and the spell cards to help summon them need to be in hand. If either are in the hand without the other, it’s a brick and the deck underperforms. Previous article[YuGiOh Goat Format] Tribe-Infecting Virus is not mandatory.